Up on a hill above the town is the Castillo de los Marqueses de Villafranca. The castle was constructed by the second Marques de Villafranca, Don Pedro Alvarez de Toledo during the 15th and 16th centuries over the remains of a previous castle which had been destroyed in 1507 by one of the illegitimate sons of the first Marques of Villafranca, Don Pedro Alvare Osorio. Unfortunately the castle was sacked and partially dismantled by the British army as it marched towards Lugo in 1809 during the Peninsula war and again, but by French troops this time, between 1815 and 1819. 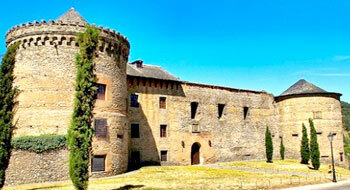 Over the intervening centuries the castle has undergone some restoration and it continues to be home to the descendants of the Marqueses de Villafranca. You can visit the gardens for free, but as it is a private residence if you wish to visit the interior you will need the permission of the owners. The Iglesia de San Francisco is also worth a visit. 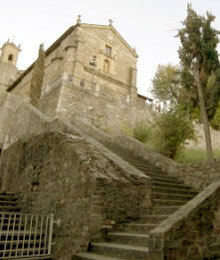 It is said to have been founded by Saint Francis of Assisi whilst undertaking a pilgrimage to Santiago. The building had originally been part of one of the pilgrim hospitals in town but was moved to its current location in the late 13th century. If you are staying here for the night you have the choice of 3 albergues, one of which is called Ave Fenix (as in the bird the Phoenix) due to it having burnt down in 1996 and then been rebuilt, or you can stay at one of the 3 hostals or the Parador. There are also some reasonable restaurants and café/bars if you want to eat or drink. Before we leave Villafranca del Bierzo I would like to recount a local legend. It doesn't have any direct link to the Camino but I thought it was interesting none the less. About 11 kilometres from Villafranca del Bierzo you will find el Lago de Carucedo. Many centuries ago it was rumoured that where the lake is now there once was a village. This village was close to a monastery where a young orphan was being raised by the monks. When this child grew to be a man he fell in love with a young woman. However, our young man had a rival, Señor Cornatel, the local squire and owner of the castle had taken a fancy to this girl and was determined to make her his come what may. One day Señor Cornatel was found dead and the young man was accused of his murder so he fled the village. Many years passed and our young man returned to the village hoping to find his lady but he found that she too had disappeared. Disillusioned the young man went to the monastery where he had been raised and became a monk, eventually becoming the abbot. One day the lady who he had fallen in love with returned to the village and they began a relationship, despite the man having taken a vow of chastity. This angered God and he sent a huge flood towards the village destroying it completely and thus creating the lake that can be seen there today. It is said that during the festival of San Juan the bells of the submerged monastery can be heard to toll each night. Another legend says that the lake is believed to hold the sword that belonged to Roldán – a bit like the Spanish version of King Arthur and Excalibur.